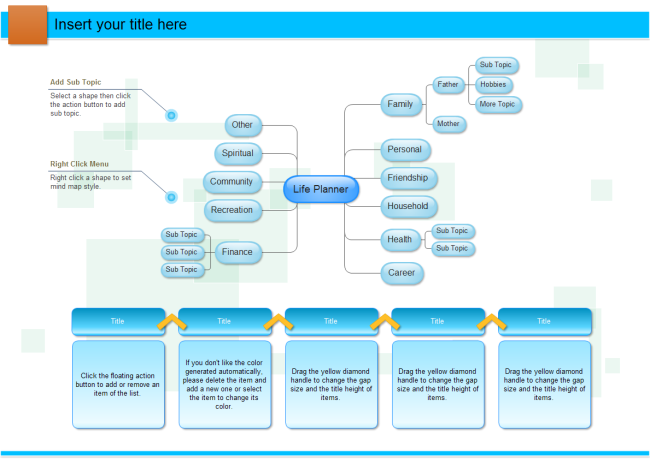 Mind map is an optimal tool for crafting your life easily to make it more productive, balanced and meaningful and create long-lasting fulfillment. A quote from Aristotle perfectly concludes the 3 simple steps to craft your desired life - create a blueprint for your bright future. "First, have a definite, clear practical ideal: a goal, an objective. Second, have the necessary means to achieve your ends: wisdom, money, materials, and methods. Third, adjust all your means to that end." Let's take a look at it step by step. We live on purpose because people will perish without a vision. The fact is that many people lack compelling vision that can motivate themselves. As long as the goal reflects what you truly want from the bottom of your heart, it will give you endless motivation. These aims can be about any field of your life. Here is a list of goals you can take as reference. What is the ultimate goal for my life? What are the meaning and value of my life? What do I want for each respect of my life? What do I like and do not like? What do I have and what do I lack? What can I do and cannot do? Who can help me and who are my competitors? What area can I improve quickly and what area needs long time investment? Edraw mind maps can be of great help in this step because it can radiate from the center, including as many branches as possible. For each branch you can also analyze it from various aspects. To add more details, you can add Callout shapes. To highlight certain points, insert Symbols shapes. Please refer to the example below. This is essential since there are so many distractions in life. Where focus goes, energy flows. A good way to keep focused is to remind yourself those goals often. Rome is not built in one day. Constant dripping wears away a stone. When you come across setbacks, you should encourage yourself to persist. People live in a society rather than isolation. Just as Newton held, If I have seen further than others, it is by standing upon the shoulders of giants. By drawing on the elder's advantages, you can grow faster. And you also need support from others to succeed, which had better be built before you need it.